It’s been nice to actually be home this week after a month of travelling across the states to visit collectors and coin shows. Last week was the ANA’s National Money Show in Irving, Texas, and next week is our first of the triannual visits to the Whitman Baltimore Expo. We’re excited about Baltimore, as the show in Irving was rather uneventful and most dealers were holding out their better inventory for the larger Baltimore venue. We’re okay with that as Baltimore is much closer to home for us! Of course, if there are any coins that you see on the website that you’d like us to bring with us to the Charm City, please email us here and we’ll pack those items as well. We’ll have selections from our upcoming auction of items from the D.L. Hansen Collection with us at the show. We hope that you’ll take the time to stop by and view any items that might be of interest. Don’t forget that this sale ends on April 1st, and all items are part of our Guaranteed Auction Program, so they will all sell! Also, special interest-free extended terms of 90 days are available for items that are included in this sale! Why we love it: The High Relief Saint Gaudens is one of the most popular and beautiful designs across all of U.S. Numismatics. 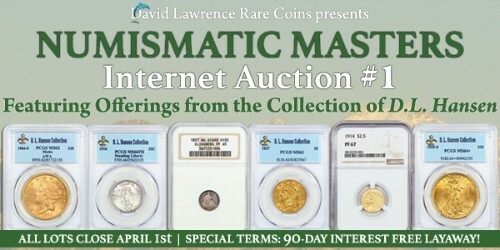 This scarce issue comes from a low mintage of only 11,250 coins struck. This stunning gem example is housed in an old NGC “Fatty” Holder and displays perfectly pristine surfaces with a fresh, original overall look. We think that this coin would garner a “plus” with the possibility of it even grading at a full 66 if someone wanted to attempt. Value: CAC’d examples have completely disappeared from the market in gem grades in the last year, with the most recent piece selling for $84,000 in a sale last month. The Price guides don’t capture the actual value of these pieces in the current market, but the CPG Price does stand at $59,000 for a CAC’d example. That all goes without saying that a likely "Plus" grade with aspirations of MS66 that would be worth over $70,000! Value: The PCGS Price Guide has this coin valued at $53,500, and the CPG Value is at $51,400. 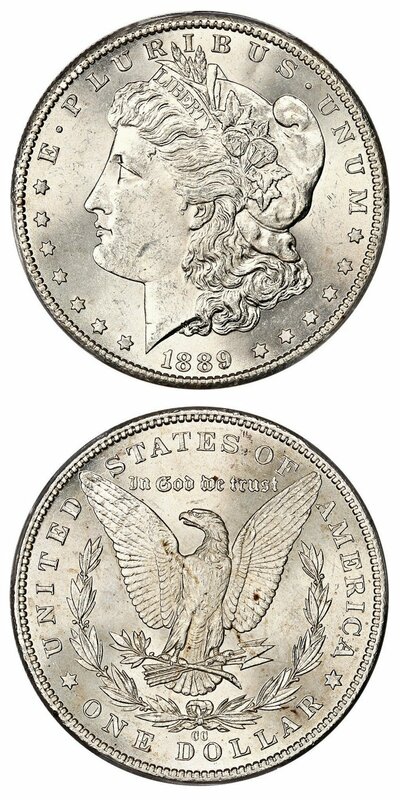 With the reserve of just $46,000 in this week’s auction, we expect this coin to go quickly as it is a fantastic numismatic opportunity to own a famous key date Carson City Morgan Dollar! Why we love it: We’ll be highlighting a coin each week from the upcoming Numismatic Masters sale of duplicates from the Hansen collection. While this offering consists mostly of gold, there are a handful of silver type coins, headlined by this amazing key date. A stunning gem Full Head example of this famous key date rarity that is greatly desired by all collectors and investors of U.S. coinage. This coin displays mostly bright white, lustrous surfaces with some subtle highlights of toning and spectacular eye appeal. This issue originally comes from a mintage of just 52,000 coins stuck, in which there are only five other examples graded finer by PCGS. Value: The PCGS Price Guide has this coin valued at $57,500, and this coin is a part of our Guaranteed Auction Program and is guaranteed to sell. With a starting bid of $43,250, this is a great opportunity to win this famous key date rarity in pristine gem condition with the Full Head designation! Why we love it: A lovely near-gem example of this underrated better date New Orleans Mint Issue Liberty Seated Half Dollar. This coin displays truly captivating color that features a darker rose-gold at the center of the obverse and much lighter across the entire reverse. The most gorgeous aspect of this toning is the deep, rich blue-green color fully highlighting the periphery of the obverse. The pristine, toned surfaces combined with its strong underlying luster create this piece’s high-quality eye appeal. There are only three other examples in existence graded finer by PCGS. Value: The CPG reflects a value of $6,250 with the PCGS Price Guide at $5,250. 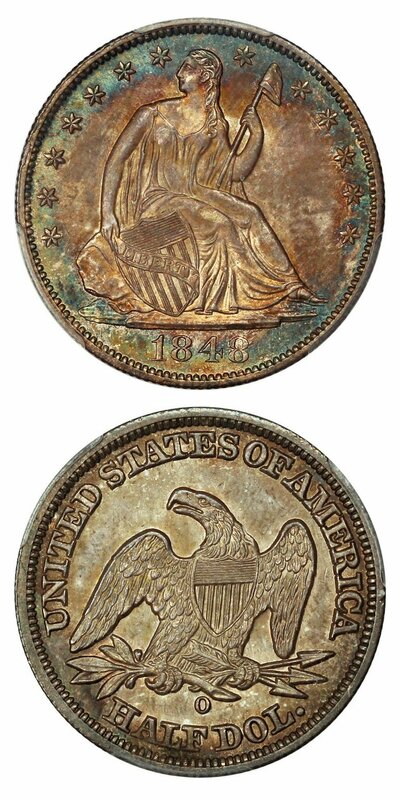 This beautifully toned coin is available for purchase at a very reasonable $4,750 via Make Offer. 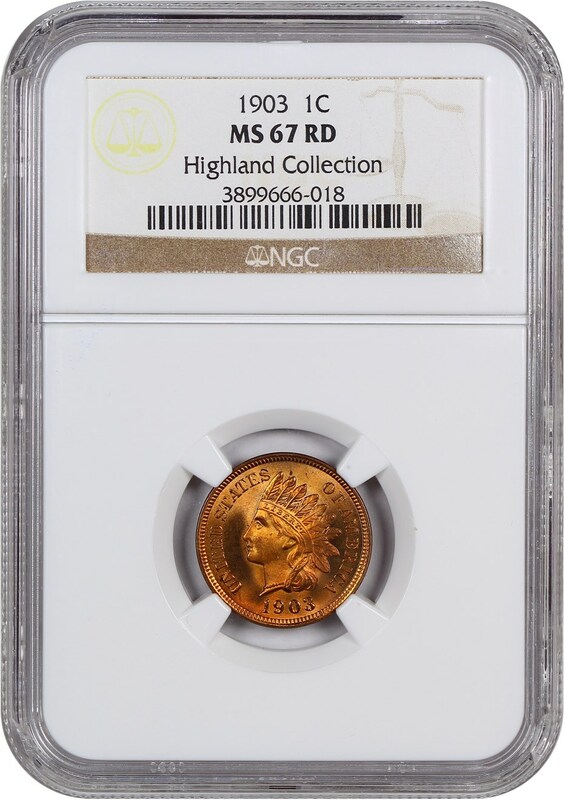 Why we love it: This blazing red ultra-gem type coin from the Indian Cent series is of true registry-quality as it features immaculate surfaces nearly without any sign of blemishes. These incredibly lustrous, vibrant red-orange surfaces make for stunning eye appeal. This coin is tied for the finest known example across all grading services and is ideal for the grade. Value: The PCGS Price Guide has this coin valued at $10,000. It is available in this week’s auction with the reserve set at the shockingly low amount of just $5,000! 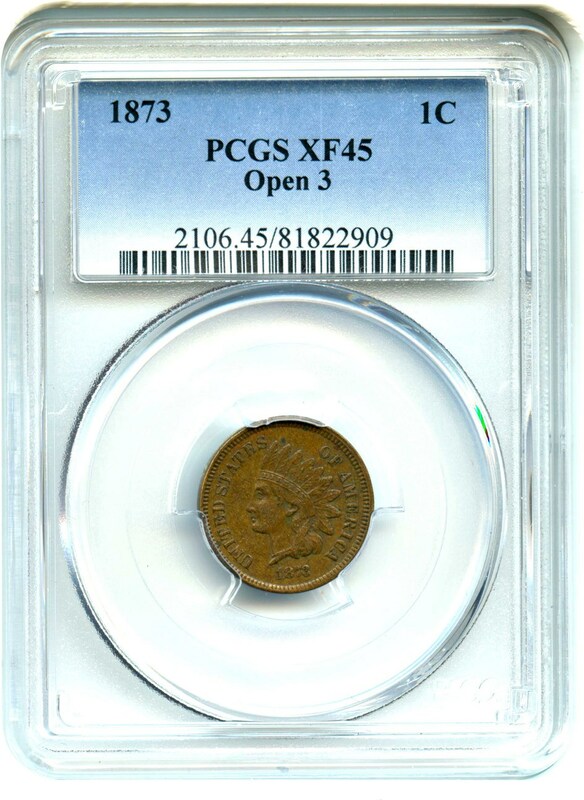 We think this is an amazing opportunity to own this registry quality, blazing red ultra-gem Indian Cent! 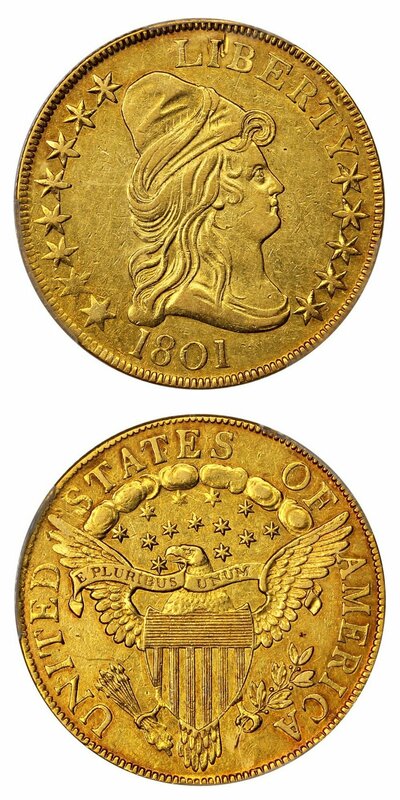 Why we love it: A scarce and early Gold Eagle issue that displays truly original and attractive yellow-gold coloring. Its well-struck clear details and few signs of any wear give this coin nice eye appeal for the assigned grade. This popular Draped Bust Gold issue comes from a tiny mintage of only 44,344 coins originally struck and is perfect for the type collector. Value: The PCGS Price Guide has this coin valued at $18,000, and the CPG Value is slightly higher at $18,800. However, this scarce early Draped Bust Eagle type coin is available on our site for just $15,500 via Make Offer as part of our CWL special. Why we love it: A stunning ultra-gem example of this popular Morgan Dollar issue housed in an Old Green Label Holder. This immaculate gem features gorgeous, bright magenta toning across the entire coin that is especially vibrant and rich on the obverse. There are also clearly displayed golden hues highlighted strongly on both sides that, combined with the lustrous, nearly perfect blemish-free surfaces, create the coin’s beautiful eye appeal. There are only two other examples in existence graded finer by PCGS. Value: The PCGS Price Guide has this coin valued at $5,250 which discounts the value of the coveted CAC sticker. Available for slightly more at $5,500 via Make Offer. This lovely toned and CAC approved high-grade Morgan Dollar is a fantastic opportunity for any collector and reasonably priced! Why we love it: A much better date early Capped Bust Quarter issue of the Small 9 variety that comes from a lower, original mintage of 144,000. This pretty Bust Quarter features rich, deeply golden toned surfaces with subtle highlights of green and rose-colored hues. Even with its heavily toned, slightly circulated surfaces, there are still clear signs of remaining luster. 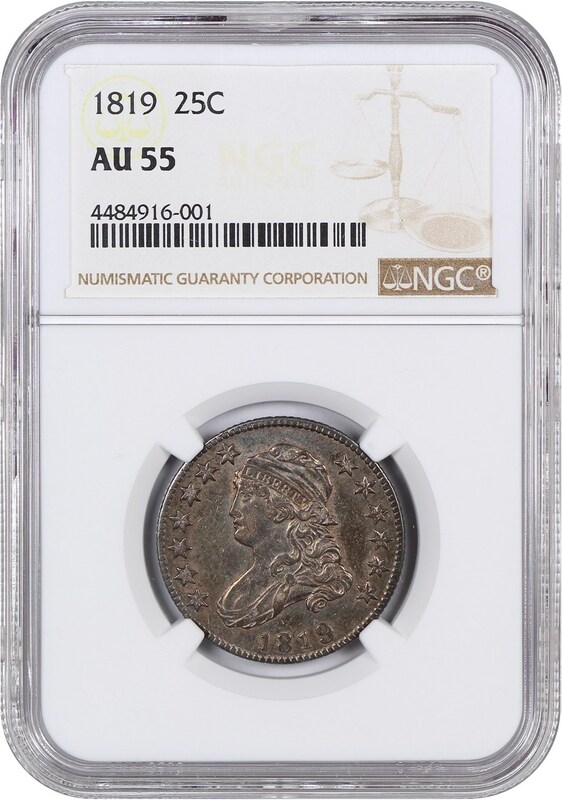 All these unique and beautiful characteristics give this coin incredibly nice eye appeal for the assigned grade. Value: The PCGS Price Guide has this coin valued very accurately at $3,850, and we are offering this appealing example for exactly $3,850 via Make Offer! Why we love it: A better date in the Indian Cent series of the Open 3 variety. This example is completely original and well-struck, including surprisingly crisp details and not too much wear for the assigned grade. These characteristics along with its pleasing lighter brown coloring makes it seem arguably at an AU level and gives it nice eye appeal. Value: The PCGS Price Guide has this coin valued at $200. It is available for purchase at the fair and reasonable price of just $170 through our Make Offer function! That is $30 below the PCGS Price Guide value for this affordable and original example of this much better date in the Indian Cent series. 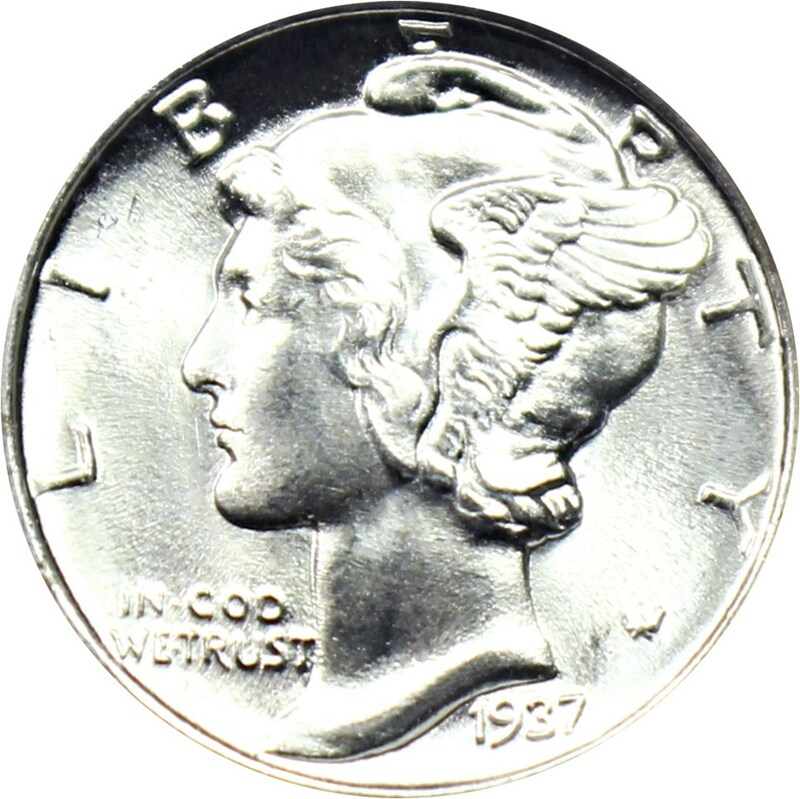 Why we love it: A blast white ultra-gem Full Bands type coin for the Mercury Dime series that’s covered in blazing luster. These bright, lustrous surfaces are so pristine and nearly completely free of any blemish that the eye appeal of the coin is simply stunning. Value: The PCGS Price Guide has this coin valued at $205. It is available for purchase at just $180 via Make Offer! 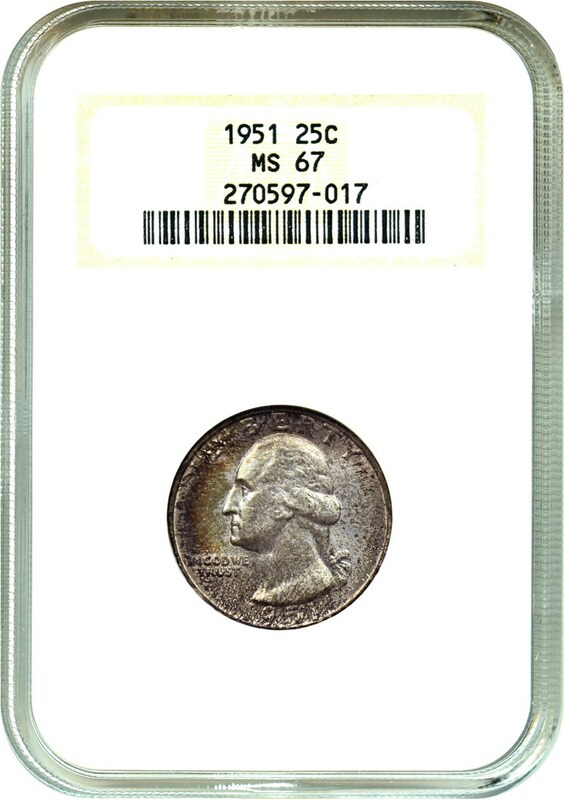 Why we love it: A beautifully toned ultra-gem type coin from the Washington Quarter series housed in an old NGC Holder. The deep, rich toning covering the coin, subtle underlying luster and pristine, well-struck surfaces give this pretty gem nice eye appeal. There is only one example of this issue in existence graded finer across all grading services. Value: The CPG reflects a value of $260 with the PCGS Price Guide at $290. We are offering this nicely toned ultra-gem for just $200 through via Make Offer! Auction #1007 Lots Posted. Browse & Bid Now! Auction #1005 Lots Posted. Browse & Bid Now!